English fisherman Andrew Cheatle had written his cell phone off as lost forever. A week later, he got it back in the strangest way. 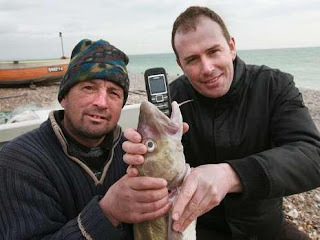 Fellow fisherman Glen Kerley from Sussex found the missing cell phone in the stomach of a fish! The caller explained that he had found the missing cell phone in the stomach of a fish. And he was telling the truth !! Cheatle noted. "The phone smelled a little funny, but it worked, and I was real glad to have it back. Back in the days when Hillary Clinton was First Lady, she had a reputation to match her husband's as both ruthless and unprincipled. After her husband brought Arafat and Rabin to the White House lawn to sign a peace accord, it was Hillary who kissed Suha Arafat on the cheek. Hillary came to the New York State race for US senator with the baggage of her husband's record and reputation. She legitimately replied that she should be judged on her own record. New Yorkers gave her a chance. She proved to be capable at expressing the concerns and priorities of her constituency. She also became a vocal supporter of Israel. Under Barack Obama, Clinton seems to be learning the new rules of the game very quickly. Despite Israel's extraordinary efforts to supply humanitarian aid to Gaza, Hillary has condemned Israel for slowing down the flow of humanitarian aid to Gaza. According to American Headline News,"Secretary of State Hillary Clinton criticized Israel for placing obstacles to the delivery of humanitarian aid to the Gaza Strip. Ahead of Clinton's visit, special U.S. envoy to the Middle East George Mitchell is expected to issue a statement on the matter, saying, "Israel is not making enough effort to improve the humanitarian situation in Gaza...the U.S. expects Israel to meet its commitments on this matter." Hillary has been criticised by Jewish leaders for turning her back on her principles. I disagree. Hillary Clinton believes in Hillary Clinton. She believes in what pays her bills. She is impassioned about whatever advances her career. If her next step on the political tightrope required supporting fascism, she would shift gears with deftness. If she were offered enough money, she would support ceding New York to the Dutch royal family as a gift to the people of the Netherlands. Hillary Clinton can not be criticised for betraying her core principles. She has no core principles. Hillary Clinton is like a good computer. She will run whatever is downloaded and installed, and she will do it well. Israel should do whatever it has to do to survive . And it should pray. Israel is being deserted by long standing allies, but not by G-d. The Jewish nation has faced daunting challenges before. It has survived until now, and it will with G-d's help survive yet again. Hillary has sold us down the river. Shady trees have withered, leaving us to trek in the hot sun. Life will go on. We must thank G-d for the strength he gives us to fight and survive. And we must use that strength. There is a tradition in a monarchy when a king dies he is succeeded immediately, usually by his son. At such a time one says, "The king is dead. Long live the king !" So it is with friends. They come and they go. The G-d who sends them is eternal. Let's not forget that. The tidal wave of Obamamania and the massive "stimulus bill" that inundated skepticism has left me with a sense of foreboding. I have long felt that government should facilitate solutions rather than initiate them. With proper oversight, our ailing economy has within itself the power to recover. There are ways to encourage investment in recovery. Jindal expressed his respect for the president and his appreciation of the importance of his election as a milestone in the struggle for racial equality. After that, he laid out his differences in a clear and engaging way. The best one liner of his speech was "In my home state, there used to be saying: At any given time, half of Louisiana was said to be half under water, and the other half is under indictment." That is why Republicans put forward plans to create jobs by lowering income tax rates for working families, cutting taxes for small businesses, strengthening incentives for businesses to invest in new equipment and hire new workers, and stabilizing home values by creating a new tax credit for home-buyers. These plans would cost less and create more jobs. But Democratic leaders in Congress -- they rejected this approach. Instead of trusting us to make wise decisions with our own money, they passed the largest government spending bill in history, with a price tag of more than $1 trillion with interest. While some of the projects in the bill make sense, their legislation is larded with wasteful spending. It includes $300 million to buy new cars for the government, $8 billion for high-speed rail projects, such as a "magnetic levitation" line from Las Vegas to Disneyland, and $140 million for something called "volcano monitoring." Instead of monitoring volcanoes, what Congress should be monitoring is the eruption of spending in Washington, D.C.
Jindal had clear and reasoned approaches to a number of problems as well as an engaging way of driving home points. As governor of Louisiana he has clearly shown his ability to tackle a daunting array of problems. As a result, his approach has a practical ring to it as shown in the following paragraphs. To strengthen our economy, we need urgent action to keep energy prices down. All of us remember what it felt like to pay $4 at the pump and unless we act now, those prices will return. To stop that from happening, we need to increase conservation, increase energy efficiency, increase the use of alternative and renewable fuels, increase our use of nuclear power, and increase drilling for oil and gas here at home. We believe that Americans can do anything and if we unleash the innovative spirit of our citizens, we can achieve energy independence. To strengthen our economy, we also need to address the crisis in health care. Republicans believe in a simple principle: No American should have to worry about losing their health coverage -- period. We stand for universal access to affordable health care coverage. What we oppose is universal government-run health care. Health care decisions should be made by doctors and patients, not by government bureaucrats. We believe Americans can do anything, and if we put aside partisan politics and work together, we can make our system of private medicine affordable and accessible for every one of our citizens. To strengthen our economy, we also need to make sure every child in America gets the best possible education. After Katrina, we reinvented the New Orleans school system, opening dozens of new charter schools, and creating a new scholarship program that is giving parents the chance to send their children to private or parochial schools of their choice. We believe that, with the proper education, the children of America can do anything. And it shouldn't take a devastating storm to bring this kind of innovation to education in our country. I was particularly pleased to note Jindal's support for school choice. Additionally, he shows a genuine recognition of problems so often mentioned by Democrats as the reason to elect them. It is not without some skepticism that I listened to Jindal. Well paid workers are an asset to a vibrant economy. Real wages are going down. And jobs are leaving the country. As much as I distrust the Democrats, we need to keep the issue of a living wage in the public forum. The price of stock is only one economic "vital sign." What workers earn is at least as important. One of my past times is watching cartoons with no words from other countries. I am particularly interested in Russian and Eastern European cartoons. The artistic value of some of these cartoons is very high. The music is by itself interesting. The Nu Pagodi cartoon series from Russia often draw from Russian traditional songs for their largely wordless sound track. Nu Pagodi has two main characters. There is Volk (Wolf) and Zayits (Rabbit) It has generally four words that it employs, no matter what the plot is. In addition to Volk and Zayits is "Nu Pagodi" Which is usually shouted at the end of each episode by Volk and roughly translates as "I'll get you yet !!" The cartoon is high quality. Its graphics remind me of American cartoons. The Czechs came out with a cartoon series called "Krtek". Krtek is "mole" in English. Each episode involves the mole in a different adventure. The graphics look like Czech folk art. 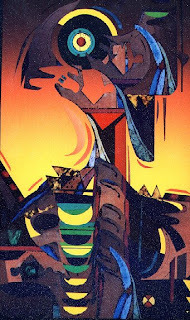 I find myself as absorbed by the art as by the plot. I watch these cartoons with my children. They focus on Krtek's adventures. I focus on the art work as much as the plot. When children and parents each experience the cartoon at their own level that is what makes a good cartoon. There was a lot of good music art and film behind the iron curtain. It was a struggle to maintain one's integrity. Frequently in books, authours were forced to include in the text a speech extolling Marxism. Sometimes the speech seemed absurdly out of place. Readers developed the skill of flipping past the propaganda and reading without the propaganda inserts. Under Nazi rule, a lot of artists went through what was called an "inner migration" in which they dwelled on "safe" topics or shrouded their social criticism in allegory. I wonder how much this phenomenon also characterised life under communism. I hope that the films, music and art of the communist era are preserved. Most people tried to get by, to find and even create enough beauty to make life liveable. 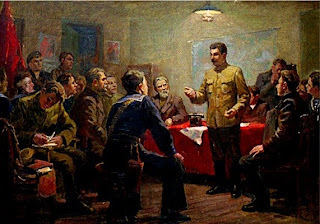 In the darkest days of Stalinism, a dreary style known as Socialist Realism became the official artistic ideal. Fortunately, this idiocy was abandoned with time. I am including with this posting a Nu Pagodi video as well as a Krtek sample. I hope my readers enjoy them both. I have been trying to buy a copy of the Tanya with English translation. If there is any one publication that is associated with Lubavitch, it is the Tanya. I have no idea why so perennially popular a publication has been out of stock for several months at Kehot Publishing. They should really keep it available in translation. There are three different ways of gathering in exiles. One is to bring in people who are Jewish but not observant. The second is to welcome and bring in people who strayed from an observant upbringing. The third is to bring in "lost tribes and people who may have been Jewish generations ago, such as the conversos, the Abuyudaya and the Jews of India. We also need to work on the conditions that make people leave in the first place. Anyone who's child does not fit into the educational mainstream is on their own. Tuition expenses are outrageous. Wouldn't it be amazing if there were regional Jewish school districts with financial backing systematised? What if people could pay taxes to their Jewish school district and place their child where most appropriate? Our current educational network needs to be reexamined and worked into a system in which our diversity can be accommodated. American Jews should consider this. Even if you are a "dove" and privately favour giving up land, Israel is under enough pressure to give up land already. If you come out for a "land for peace" proposal, you are undercutting Israel's diplomatic position. Additionally, you are getting a "land for war" agreement. The Lubavitcher Rebbe was prophetic in his predictions about the Holy Land. His teachings about not giving up land and "who is a Jew" are among any number of teachings that are more relevant than ever. Whoever disseminates the Rebbe's teachings is doing the world a public service. Honking your horn and putting up "The Rebbe Is Moshiach" signs adds nothing to public discussion other than to turn people off who might otherwise listen to the Rebbe's teachings. When Moshiach does come, everyone will agree from Williamsburg to Crown Heights, from Lakewood to Flatbush, From Meah Shaarim to Rosh Haayin. That all will agree on the identity of Moshiach will be the biggest miracle of all. This has not happened yet. Police in New York are really working hard to protect likely targets from terrorist attack. In tough times, this is a heavy expense. 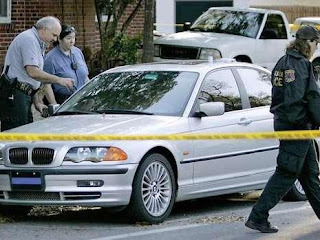 Terror organisations have not scored a hit in the US in a long time. But they should be made to pay for the time and expense of protecting ourselves against them. I have spoken to people who had a real hard time reporting crimes in Brooklyn. Reports were "lost". Offenses were given classified as less serious than they really were. Crime is up a lot more than is being admitted. It keeps property values up, it makes some police brass look good. But it's kind of like touching up x rays instead of treating the patient. I was discharging a passenger who was disabled from a van in Flatbush. While I was sitting in the van making sure the passenger got inside, a cop ticketed me for double parking. I spoke to someone in Pittsburgh who said that parking at an expired meter is an ELEVEN dollar ticket. New York hasn't had tickets that low in decades. New York City parking tickets are robbery with a government permit. When was the last time you had a real bagel? My idea of a bagel is the kind that is heavy. How heavy? I like my bagels so heavy you can wing them through a plate glass window. Most bagels I buy today are like Wonder Bread with too much crust. Religious dress codes have me baffled . I think denim skirts are modest and totally acceptable. Some people say it's "not chassidish". Why? It's a spin off from denim pants that were sold by a Jewish dry goods merchant during the gold rush named Levi Strauss. That's Jewish enough for me. I always had a warm fuzzy picture of chimpanzees. The story that made the news recently was a shock to me. What would make a chimpanzee break down so completely? The injuries suffered by the woman who had known him for years took incredible physical strength. The friend who came to visit him actually had her jaw ripped off. Public interest would seem to favour an autopsy. What caused the chimp to snap? This is not the first time I have heard stereotype busting animal stories. I once read about a seal biting a man's nose off. A duckbill platypus has a poison claw that inflicts a very painful sting. Even when a lion is domesticated, a playful slap of its paw that would be amusing from a house cat can prove lethal. My heart goes out not only to the victim of the crazed chimpanzee but also the owner. It is unimaginable that animal rights activists would be making harassing phone calls to her for having the crazed animal killed. WCBS reported threats against her by animal rights activists. "She's getting phone calls from PETA, and people, you know [are making] threatening phone calls, saying she killed Travis, but it's not what she did," a relative is quoted as saying. People are not going to stop owning animals. 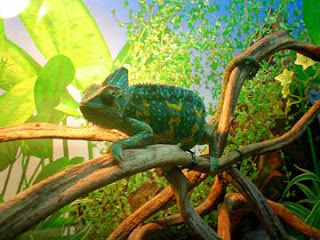 Some people are going to go for exotic species. It is a matter of pressing public interest to try to find out what made Travis the chimpanzee snap. If all it took was being approached by a long time friend who confused him with a new hair style, it raises serious questions about whether chimps or other primates are suitable as pets. I was disappointed at Sean Delonas for his cartoon that seemed to tie Travis the chimp to Barack Obama. Delonas is a brilliant artist who frequently shreds good taste and political correctness. Although he treats political news in his cartoons, he usually does not make political points but his own brand of sometimes tasteless comedy. He has made several cartoons that make fum of Heather Mills having lost a leg. The recent cartoon of Travis the chimp goes beyond the usual tastelessness that endears Delonas to his fans. 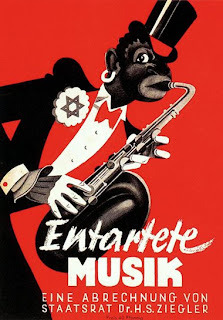 For years cartoons that portray African Americans as monkeys have been a staple of racist caricature. Understandably, the cartoon touched a raw nerve. Predictably, it brought out Al Sharpton, who is no stranger to anti white racism. Fortunately, State Senator Eric Adams gave voice to the anger felt by many. "It's clear that you are out of touch with this entire country. Americans went to the polls to elect a man of honor from its country, not a monkey not a chimpanzee. This is not funny, this is not a cartoon, this is disgusting," said State Senator Eric Adams. Adams, a founder of One Hundred blacks in Law Enforcement is a representative of a racially diverse district in which he is seen as a bridge builder and champion of peace. Unlike Sharpton, his credentials as an advocate for civil rights are beyond reproach. I am very sympathetic to the criticism of the Post cartoon. Racism is alive and well in America in both its white and African American varieties. 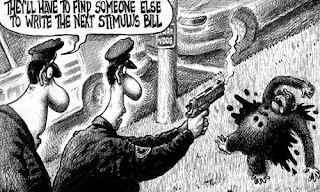 The Delonas cartoon lends itself to suspicions of racism. The tone and intensity of condemnation is appropriate. We are at the start of four years with an African American President. He will be the subject of much caricature. I hope that protests do not ensue every time that Obama's facial features are distorted in a cartoon. Irreverence is a staple of political caricature. The uncritical treatment of Obama in the national press makes the need for an iconoclastic approach that much more pressing. Al Sharpton has made his career stereotyping and baiting whites, Jews and Koreans. It is fortunate that Eric Adams has lent his to this issue a stature that Al Sharpton so sorely lacks. The anti white bigotry of Sharpton and the free pass he has gotten from the press in purveying it is at least as much an issue as a tasteless cartoon. President Obama has called for a "national dialogue on race." Dialogue is by definition a two way street. In such an endeavour, Eric Adams is a worthy participant. Reverend Al Sharpton, however is not interested in a dialogue but a sermon. New York has enough one way streets already. We don't need one more. Where Does Everyone Go When the (Communist) Party is Over? Years ago when my wife and I were newlyweds, I wanted to buy my wife a greeting card for an important anniversary. I think it was the eighth month since our first date. Near my work was a drugstore with a greeting card section that was half Spanish and half English. The English greeting cards were riddled with double entendre. It was the type of humour that would have been mild on the loading dock where I worked but didn't express the tender feelings of a newlywed. My Spanish is mostly a slow motion affair. If someone leaves El Diario on the train, I can break my teeth on a story and walk away with something. When I went into the Spanish section of the greeting cards, I found that they really expressed what I was feeling. The photography and drawing evoked romantic themes. The verses expressed a range of emotion far closer to what I was feeling. I ended up buying a Spanish card for my wife. I understood about two thirds of it. The rest I figured was probably OK. When I went to visit my mother in Seattle once, the American music on the plane was awful. I was switching channels every five minutes. I switched to the Latin channel and stayed with it through three time zones. That was the plane ride that I discovered Ricardo Arjona. It is amazing how many different types of Spanish music there are, from bachata to Europop, from Andean music to the various forms of Cuban music. I once heard a British radio program that matched points in Africa with various types of music in the western hemisphere. Maybe it's my Sephardic ancestry. Maybe it's someplace I've lived in this life or another. I always get a feeling from Spanish speaking people that their ancestors boarded a different boat from that boarded by my family. The Spanish speaking world is always on my mind. I feel that choices made years ago made me who I am today, and that I am looking at who I could have been. I have always been fascinated with how people cope with totalitarian government. My father since he was Jewish did not experience the regimentation and thought control of Naziism. He saw the Hitler Youth marching. My aunt used to see Der Sturmer posted with its lurid headlines. But my aunt and father were outsiders. They observed the Nazification of Germany. It was a different experience than feeling it quicken their pulse or melting into a cheering throng. I had German teachers explain it to me later with varying degrees of candour. My father always used to stress that life goes on, that much of life is the same here as it is there. I like to take a nation's pulse by sampling its entertainment. I have watched propaganda videos from Poland and North Korea. I have seen Iranian movies made for domestic consumption and for foreign film festivals. I like movies that show how ordinary people live. I like to sample as many variations of ordinary as possible. Watching movies is my way of traveling. I get claustrophobic if I watch three American shows in a row, unless it concerns Acadian French, Melungeons or some other ethnic group that interests me. Today I was daydreaming of Cuba. For some reason its communist system just keeps on. Will it fade away or implode? What new challenges will the next revolution bring? I brought up some Cuban pop music. There is a great group called Boni and Kelly, that sings the type of Italian music I used to listen to in high school. They are popular in Cuba, having been trained in Cuban schools. Additionally they have an international following. Some of their music is more Euro, some more African in its influences. Here is a link to their website. I am really happy to discover them. Their lyrics are not political. Some groups give you the feeling that there is a hidden message in their lyrics. Boni & Kelly do not seem that way. Their music would fit nicely into any Latin Top 40 playlist I wish them and their country well. With Cuban music and Cuban baseball*, a free Cuba has some great days ahead. I hope those days start soon. * Cubans are avid baseball players and fans. Baseball distinguishes Cuban identity from Spanish identity in a way that bullfighting does not. Ever since Washington's Birthday and Lincoln's Birthday were lumped into "President's Day" I lost respect for the new holiday. Millard Fillmore in the 19th century and Jimmy Carter in the 20th bear living witness to the inequality in stature of of former presidents. There is a Jewish saying that "The heart of a leader is in the hand of "G-d". This principle becomes apparent in Exodus in 14:4: And I will harden Pharaoh's heart, that he shall follow after them"
It has happened that more than once in recent history that Presidents who harboured strong personal prejudices against Jews were instrumental in helping Israel at a critical time. Richard Nixon gave critical help to Israel in 1973 during the Yom Kippur War. It is reported that Nixon ordered an airlift of thirty plane loads of badly needed weapons to Israel. In the tape recordings made in the White House that proved to be Nixon's undoing, he war heard on numerous occasions giving vent to crude anti Jewish remarks. Despite this, Nixon is remembered with gratitude by Jews who recall his extension of critical assistance to Israel in its time of peril. Harry Truman is lauded by supporters of Israel for extending American recognition to Israel within minutes of its founding. What was not widely reported is that Truman's private attitudes towards Jews were quite checkered. David Susskind, well known producer and talk show host worked on a television documentary about Truman, traveling to the former President's home in Missouri to do so. In his book Confessions of a White House Ghostwriter, James Humes reported the following about a conversation with Susskind concerning his collaboration with Truman. Susskind said that each morning he would arrive at Truman's house at Independence [Missouri]. He would wait on the porch on a cold February day while Mrs. Truman went to inform her husband of his arrival. After about the fourth morning, he asked the president in his walk why he was never asked inside. "You're a Jew, David, and no Jew has ever been in the house." A nonplussed Susskind replied, "I am amazed that you who recognized Israel and championed the integration of the army would say such a thing!" "David," he explained, "this is not the White House – it's the Wallace [Bess Truman's maiden name] house. Bess runs it, and there's never been a Jew inside the house in her or her mother's lifetime. I wish there were more "Jew haters" like Truman and Nixon. Herbert Hoover is unfairly pegged with responsibility for the Great Depression. While a President may have a lot of influence, economic policies tend to be like acorns which take a long time to become trees and give meaningful shade. A lot of the problems that gave rise to the depression were systemic shortcomings that were only discovered after the fact. One achievement of Hoover that is little noted by historians is his work in hunger relief during the Russian Civil War from 1918 to 1921 as reported on answers.com. As World War I ended, the United States helped many countries around the world recover from the effects of war through the American Relief Administration (ARA). Herbert Hoover headed the ARA and had opened numerous missions in Europe by 1919. The primary goal of the ARA was to provide food relief, but it also provided medical aid, relocation services, and much else. The ARA attempted to open a mission in Russia in 1919 and 1920, but they were unsuccessful because the Bolsheviks suspected that the Americans had intervened in the Russian Civil War. However, after the horrible famine of the winter of 1920 and 1921, and after writer Maxim Gorky petitioned Vladimir Lenin to provide relief, the new Soviet government recognized the need for the ARA in Russia. It takes a long time for history to properly assess a president. Reagan, although scoffed at during his presidency is widely credited with being instrumental in the fall of communism. The jury might still be out on his economic policies. If the current economic crisis is properly studied and learned from, its roots will need to be traced back through several presidential administrations. What caused our current slump? Was it extending countless bad mortgages? Was it deregulation of financial institutions? Honest history is a prerequisite for any effective economic remedy. Who was the worst President of the twentieth century? I would nominate Jimmy Carter. It was under his administration that Iran was transformed from an American ally into a sworn enemy due to refusal to support the Shah against those seeking to overthrow him. Predictably, the human rights so championed by Carter suffered dramatic setbacks in Iran after the Shah was overthrown. The advantage of President's Day over over a focus on Washington and Lincoln is that it moves one to focus on leadership in different circumstances. Some of the mediocre men who preceded Lincoln in the presidency laid the foundations for crises that spun out of control during the Civil War and the Lincoln administration. Study of some of the lesser known presidents sheds some light on issues related to the Civil War that are less discussed such as the relationship between agriculture in the south and industry in the north. Times of crisis demand greatness of those in power. Peaceful times demand quiet and unheralded wisdom. Everyone remembers September 11. Every day of peace, every "slow news day" is by grace of G-d the product of thankless self sacrifice on the part of America's defenders. We should be as thankful for each day of peace as we are for each great victory. The Fourth of July and Memorial Day have obvious meaning and value. One is the birthday of the country. The other honours those who made the ultimate sacrifice in defending our country. Thanksgiving affirms our dependence on a higher power. With the outsourcing of jobs and attacks on the earning power of American workers, perhaps a renewed commitment to the ideals of Labor Day might be in order. I almost always work on civil holidays. It is the nature of my profession. But I do reflect on the message of each holiday. President's Day is a fitting time to pray for the welfare, wisdom and courage of our President. It is also a good time to think about the challenges faced in each administration as well as each generation. As Israel chooses its next leader, I find myself extending the same prayers and fond thoughts to the leadership and people of Israel. To both nations, each dear to my heart I wish a happy President's Day. Since its founding in 1948, Israel has had a Right of Return. Jewishness involves the land, the law and the people of Israel. All are inextricably intertwined. Many commandments are communal. Torah teaches us how to relate to the land and the people of Israel and the world. Jewish education is critical to Jewish continuity. An appreciation of Jewish traditions, land and people can not be inculcated without schools. Even the socialisation that accompanied school attendance especially increases the likelihood of marriage within the Jewish faith and people. We urgently need a Law of Return that applies to synagogues and Jewish schools. There must be a seat for every man woman and child in a synagogue and a day school for those of school age. Adult education is essential as well. We need to identify underserved areas and target development. Whether a child is a talmudic genius or profoundly retarded, whether a child is docile or rebellious, there must be a place for him or her. I am outraged when I hear that Israeli government wants to give away the Golan, Jerusalem or any part of the Holy Land. To give away Jewish land is to spit in G-d's face. The Holy Land was allocated to the tribes upon basis of population. Each tribe wanted to be fully counted so they would get a just allocation of land. When we are with G-d's help gathered in from exile, how many Jews will have been sent away. How many Jews will be lost to us and go uncounted? We pray for the ingathering of exiles. Are we doing it ourselves ? When Jews were lost in exile thousands of years ago, was there no look of distraction, no whiff of alienation before they disappeared? What are we doing to discern and address that sense of emptiness that disperses so many? I could never compare the Jewish faith to any other. 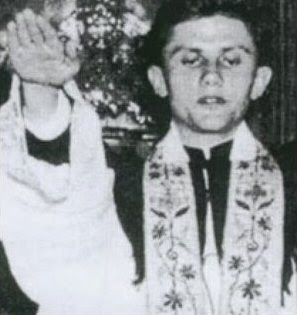 The church of Martin Luther who cursed Jews and that of Rome which included the likes of Hungarian Nazi Andras Kun, Slovak Nazi Josef Tiso and American Jew hater Charles Coughlin should not be mentioned in the same breath as the Jewish faith. Despite that, I experienced in a Catholic upbringing one thing worthy of emulation. My brother, my sister and I all attended Catholic schools. We were without exception discipline problems. My brother and I openly repudiated core Catholic teachings as well. As hard as I tried, they never expelled me from school. Neither were my brother or sister kicked out. I can not understand how a faith that has had a third of its number murdered in one generation, that loses souls daily to cults, intermarriage and ignorance can countenance the loss of one Jewish child. It saddens me. It is only the deepest love for the Jewish people that motivates me to make such a rankling comparison. I ask forgiveness of anyone who saw "Gott Mit Uns" on a German belt buckle for making a comparison that must be painful to hear. Millions of Jewish dollars go to secular education. I do not propose stopping that flow. But the preservation of Jewish teachings is not only a gift to G-d and ourselves but a gift to the world. If we do not preserve our own heritage, it is the world that is poorer for it. Feeling and showing love for each other will lend resonance to our love for the world. Every miracle extended by G-d to the Jewish people involved an action by a person. Even though G-d did all the work, there were times when Moshe had to raise his staff or raise his hands. G-d does not want us to be spectators. He does not want us to watch miracles but to participate in them. We must not only pray for the ingathering of exiles. We must make it happen ourselves. At a White House press conference, veteran White house correspondent Les Kinsolving gave lie to any pretensions of fairness in the so called "Fairness Doctrine." According to World Net Daily he asked President Obama the following question. "How does the president believe that the First Amendment can be upheld if the so-called Fairness Doctrine is reinstated and applied only to electronic media and not to any newspapers, magazines, and wire services?" The answer from the White House press secretary, Robert Gibbs was predictably evasive. "Les, I pledge to you to study up on the Fairness Doctrine so that one day I might give you a more fulsome answer – even after 37 questions in 40 minutes." The press secretary's answer was in response to an earlier question by Kinsolving in which Kinsolving asked "In President Kennedy's first press conference in 1961, he announced 37 questions – he answered 37 questions in 40 minutes. My question: Will President Obama study this transcript?" Mr. Kinsolving's question cuts straight to the heart of the issue of the so called "Fairness Doctrine." how can a "Fairness Doctrine" be fair if it leaves the major television networks off the table? What the Obama could do to put all doubt to rest is simple. he could issue the following statement. "I will veto any revival of the Fairness Doctrine that was passed in 1949. I support certain opinions that I believe are underrepresented. The best way to correct this is with more free speech and not by suppressing the free speech of others." Obama has been evasive about his commitment to free speech. It seems highly likely that a wink an a nod from 1600 Pennsylvania Avenue is emboldening enemies of free speech in the Senate who want to regulate conservative opponents such as Rush Limbaugh and Michael Savage. A revival of the "Fairness Doctrine" would be like throwing a tear gas grenade into the courtroom of public opinion. Free speech is a powerful check on the power of elected officials between elections. If the Democrats are limited in their persuasive power or if they are defending ideas that are fundamentally flawed, this should be brought under the full light of public scrutiny. Freedom of speech is a cornerstone of our nation's values. The Democrats should see an outpouring of public feeling on this crucial issue. When the "Fairness Doctrine" is properly explained, it gets a resounding vote of disapproval from voters. It forces the government into scheduling programming on radio stations, creating formatting requirements that makes certain types of programmes impossible to schedule. Current laws do not bar liberals from buying stations or air time. No law can force people to listen to a radio programme. The Democrats have the opportunity to present their product. It is not selling. They have to go back to the drawing board. The Broadcaster Freedom Act of 2009 is a plausible solution to the sword over the throat of free speech being waved by Democrats. It reads as follows. Notwithstanding section 303 or any other provision of this Act or any other Act authorizing the Commission to prescribe rules, regulations, policies, doctrines, standards, or other requirements, the Commission shall not have the authority to prescribe any rule, regulation, policy, doctrine, standard, or other requirement that has the purpose or effect of reinstating or repromulgating (in whole or in part) the requirement that broadcasters present opposing viewpoints on controversial issues of public importance, commonly referred to as the `Fairness Doctrine', as repealed in General Fairness Doctrine Obligations of Broadcast Licensees, 50 Fed. Reg. 35418 (1985).'. It has been introduced in the Senate by Senator Jim DeMint of South Carolina and Representative Mike Pence of Indiana to the House of Representatives. Support for this bill is a positive way to make a statement on press and broadcast freedom. The Democrats dismiss it as a "distraction". Anyone who is so wrong as are the Democrats on freedom of the press and broadcast media is probably wrong on a multitude of other issues as well. If this is not the case, then let them defend themselves in honest debate instead of by silencing others. 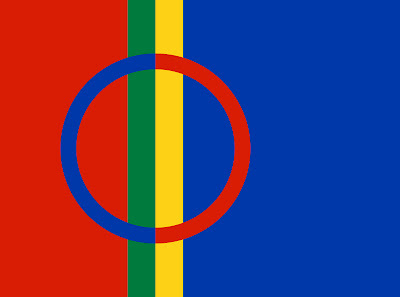 SOLIDARITY WITH THE SAMI PEOPLE OF NORTHERN SCANDINAVIA !! SOLIDARITY WITH THE CAPTIVE NATION OF SAPMI !! There is probably nowhere in the world where the original inhabitants have remained put since time immemorial. The Scandinavian countries are not an exception to this general rule. In the north of Sweden, Norway, Russia and Finland is an ethnic minority that predates the arrival of the majority population by centuries. This group is scattered across the north of Scandinavia, inhabiting a region known as Sapmi. Due in good part to forced assimilation, the number of Sapmi speakers has dwindled to between 80,000 and 150,000. They are most commonly known as Lapps or Laplanders, although this is considered a derogatory term. "Sami: is the acceptable term for this ethnic group. The origins of the Sami are a mystery. DNA evidence suggests a link to Basques and Catalonians. Their language itself is however of the Finno Vogaic family. The most common association with Sami people is reindeer herding. This is not without basis in fact. Today about 10% of Sami are involved in reindeer herding, although jobs in fishing, fur trapping and sheep herding are far more common. The criteria for Sami identity are nebulous. The Norwegian government recognises anyone with one Sami speaking great grand parent. Customs, familial ties and regional loyalty are also defining factors in the absence of fluency in the Sami language. Sami faced an uphill battle in their effort to retain their identity. Social marginalisation as well as an educational system that stressed the value of assimilation took a heavy toll on their numbers and their cohesion. Additionally the Russians deported the Russian Samis from their traditional homes to a collective farm which was considered to be less of a security risk. In keeping with the belief set forth in my previous article, the Sami people have a right to their own homeland. It is urgent that Norway, Sweden, Finland and Russia convene a regional conference concerning the Sami. This conference should deal with territorial concessions by each of the countries occupying the ancestral homeland of the Sami people. Additionally, the issue of compensation for cultural and economic disposession over the centuries must be considered, as well as the repatiation of any non Samis occupying Sami territory. Since Norway contains over half of all the Sami people, it is fitting that the conference concerning Sami self determination should be held in Oslo, Norway. The agreement concerning the Sami homeland should be known as the Oslo Accords. The miscarriage of justice that has resulted in the illegal occupation of Sami lands must be redressed. Justice delayed is justice denied! Self determination for the Sami People !! End the occupation now!! Rising up to the skies. Out towards the stormy sea. Swish of sled on winter road. On forests, seas and shores. With the golden seas, golden lakes. 'round sparkling poles, shining oars. Hail thee, tough Saami kin! Hail thee, root of freedom! Amongst the peaceful Saami kin. P.S. I think the world should reward the Sami people for their patience. There are no Sami terrorists and no Sami suicide bombers. They are a nation without a country that has been peaceful good neighbours. They deserve our thanks. It is with a mixture of frustration, puzzlement and astonishment that I look at Israel on election day. It seems supernatural that the entire world is focused on the conflict in Gaza. The body count in conflicts elsewhere dwarfs that in Israel's wars, yet the Israeli conflict grabs all of the headlines. When I see five million dead in the Congo, three million dead in the North Korean man made famine and 200,000 dead in Algeria, the accidental death of a handful of Arab civilians at the hand of Israelis fighting by gentleman's rules seems thunderously trivial by comparison. I do not see Israel ever being judged kindly by the Europeans or anyone else. It seems absurd to try to win over world opinion with more concessions to enemies that want to wipe us off the face of the earth. The USSR had one party elections. Israelis elect an alphabet soup of parties that then form a "National Unity Government." In practical terms, the distinction between the two is academic. In the USSR, people knew that there was no choice. In Israel, we are deprived of choice in back room deals. The same leaders who promised a united Jerusalem and other wonderful things get into office and make secret deals to give away territory and sell out. Religious parties sell out territory and endanger lives to get a money for their yeshivot. One can vote for fine words without knowing what is behind them. In this election, very few things are certain. Likud is better than the communists. Olmert acts like someone in Damascus just put money away for him in a Swiss bank account. I can not say more than that with any certainty. I pray for the welfare of the Holy Land. I find myself praying not only for deliverance from our enemies but from ourselves. It seems to me to be an open miracle how G-d rescues us from our own insanity, time and time again. Whoever wins, I hope and pray that G-d grants them clarity of vision. During the sixty years of Israel's existence, one miracle after another has poured down on us like rain. Time and time again we pour this flood of blessings upon barren and thirsty sand that is wet in the morning and bone dry at noon. May G-d open the eyes of our people and of our leaders. May G-d continue to protect us and may Moshiach be revealed speedily. Until then, may G-d protect us from our enemies and our government. Great Britain has restored its reputation as a defender of the Jewish people by the arrest of a British high ranking diplomat on charges of "inciting racial hatred". He actually faces seven years for an an incident in a gym in which he cursed at a television set that was broadcasting news of the Gaza offensive. The Daily Mail reported on the incident as follows. "A high-ranking diplomat at the Foreign Office has been arrested after allegations that he launched a foul-mouthed anti-Semitic tirade. Middle East expert Rowan Laxton, 47, was watching TV reports of the Israeli attack on Gaza as he used an exercise bike in a gym. Stunned staff and gym members allegedly heard him shout: 'F**king Israelis, f**king Jews'. It is alleged he also said Israeli soldiers should be 'wiped off the face of the earth'. His rant reportedly continued even after he was approached by other gym users. After a complaint was made to police, Mr Laxton was arrested for inciting religious hatred through threatening words and behaviour and bailed until late next month. The maximum penalty for inciting religious hatred is a seven-year prison term or a fine or both. Mr Laxton, who is still working normally, is head of the South Asia Group at the Foreign Office, on a salary of around £70,000. He is responsible for all the UK's diplomacy in that area and for briefing Foreign Secretary David Miliband, who is Jewish. " There are a number of issues here. In the age before political correctness, Mr. Laxton would have been charged with disturbing the peace. It might have never even come to that. He might have been asked to leave the gym for the day. They may have even decided to revoke his membership, that his continued presence was a vexation to other club members. This is a legitimate prerogative. Mr. Laxton is being charged with a hate crime. It is true that he expressed a lot of hatred. But was he inciting hatred? The only hatred he elicited was against himself. He did not deliver a skilled speech that whipped up an angry mob. To the contrary, he annoyed everyone present. I fail to see what in his conduct merits any felony charges at all. I don't know about British law but in American law he would be accused of a misdemeanour. Unfortunately, there are additional questions. Mr. Laxton raised through an outburst that could not be blamed on liquor. Laxton's job is that of a Middle East expert. He is in charge of briefing people in the British Foreign Office about Middle Eastern affairs. He is not an uneducated individual at the bottom of the wage scale. He earns almost $140,000 a year. Laxton hurt no one at the gym. But it is hard to imagine that a person so consumed with hatred of Jews can intervene dispassionately in the Middle East where opinions about Jews are a critical dimension of one's thinking. If he were to be assigned to Zimbabwe or the Congo, perhaps his hatred of Jews would not be an obstacle to his doing his job honestly. Perhaps if he saw real genocide in the course of working in the Congo or Sudan, he might view the nonstop Palestinian hyperbole and deception in a different light. My gut instincts tell me is that Rowan Laxton forgot that he was not in a briefing room but in a public space. I am far less concerned by what he said when exercising than what he said when working. The British Foreign Office as well as the European Union have had a dismissive attitude towards terrorism directed at Israel. When The Israelis finally defend themselves after countless provocations, hypocritical Europeans talk about the endless "cycle of violence" and do their best to tie the hands of the Israelis. Prosecuting Rowan Laxton is a cheap way to let the British appear as defenders of Jews. Civilians are gleefully murdered by Arabs. In Gaza, the murder and murderers are applauded. When Israelis retaliate with a precise hit against Hamas leaders, Brussels and London are ablaze with indignation at the "cycle of violence". Through this insidious language game, an Israeli sharpshooter who kills a terrorist and a suicide bomber who kills a baby are placed on a level of moral equivalence. Israel is being pressured to take risks that can bring no rewards. All of Israel's "sacrifices for peace" have not only led to more deaths but more world condemnation. What is the correct and polite way to say ! @#$ing Jews? The Pakistan Daily, quoting Britain's anti terrorism minister, Lord Alan West shows us the way. in the following paragraph. Britain's security and counter-terrorism minister acknowledges link between foreign policy, security threats. Britain's security and counter-terrorism minister, Lord Alan West, warned Tuesday that the conflict in Gaza has set back the government's attempts to tackle radicalism in Muslim communities here. Let's put this into plain English. There is a massive influx of immigrants who look different, talk different and have a different religion. There is British prejudice against the immigrants and a bitter prejudice among the immigrant population that is a reaction to racism and to Islamist agitators. So the British want to do a little experiment. They want to sell Israel down the river and see if they will have peace at home. Prosecuting Rowan Laxton is a cheap way to appear philo semitic. It is a charade that only distracts the world from a policy of appeasement that costs far more lives than an idiot blowing off steam in a gym. Laxton talks like a British foreign minister who has had a few pints. What makes it harder for him is that he has been married to a Muslim woman since 2000. Can you imagine that? Nine years with no beer in the fridge? that's enough to make a man downright edgy. No wonder he blew off steam. I wouldn't prosecute him or fire him. I'd go out for a few beers with him. Then when he's good and soused, I'd bring him back to his apartment. Could you imagine the look on his wife's face when their whole apartment smells like a brewery? That would be enough to drive any good Muslimaa crazy. Viewed the right way the Laxton incident will help Israel realise who it is dealing with. Illusions are dangerous. Thank you, Mr. Laxton for showing us who is in the Foreign Office.